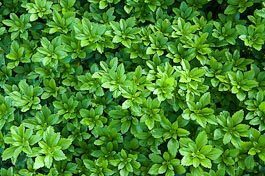 Here are some of the most popular shade ground covers. These plants are all perennial and thrive where sunlight is scarce. English Ivy (Hedera helix): Evergreen ground cover or climbing vine for sun or shade, hardy from Zone 4 to 9. Does not flower or fruit until very old. Many cultivars killed at temperatures below -10ºF (-23ºC); hardier ones include ‘Baltica’, ‘Thorndale’ and ‘Wilson’. Pruning is necessary to keep it within limits; grows rampantly in warmer areas. Do not grow in regions where it can become invasive. Spacing: 18 inches (45 cm) apart. Heartleaf Brunnera or Siberian Bugloss (Brunnera macrophylla):Perennial hardy from Zone 3 to 7 with large heart-shaped leaves, small, blue flowers in spring. Grows 12 to 18 inches (30-45 cm) tall. Space: 18 inches (45 cm) apart. Pachysandra (Pachysandra terminalis): Hardy from Zone 3 to 8; excellent evergreen ground cover for shade. The North American native speciesPachysandra procumbensis harder to find, but a more graceful and less spready choice. Grows 6 to 10 inches (15-25 cm) tall. Spacing: 10 inches (25 cm) apart. Periwinkle (Vinca minor): Dark green, vining, evergreen ground cover, hardy from Zone 3 to 8, with dainty blue flowers. Grows about 6 inches (15 cm) tall. Spacing: 18 inches (45 cm) apart. 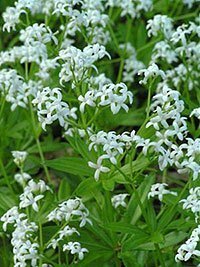 Sweet Woodruff (Galium odoratum): Perennial hardy from Zone 4 to 7 with white flowers in spring and attractive whorled leaves that die back in winter. Grows 6 to 12 inches (15-30 cm) tall. Space: 12 inches (30 cm) apart. 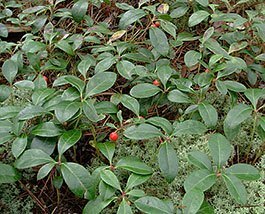 Wintergreen (Gaultheria procumbens): Native woody plant hardy from Zone 3 to 7. White, bell-shaped flowers in mid-spring, followed by scarlet berries; lustrous; creeping evergreen foliage, bronze fall color.Prefers moist, acid soil. If moss is growing well in an area, wintergreen can also be grown there. Grows 6 inches (15 cm) tall; make good underplanting forrhododendrons and other acid-loving plants. Spacing: 12 inches (30 cm) apart. See Gardening in Dry Shade for more recommended shade ground cover plants. Applying mulch before planting is a useful landscaper’s tip. After you have prepared the soil and raked it, spread a layer of wood chip mulchover the planting area – about 2 inches (5 cm) thick. When planting shade ground covers, use your gloved hands or a rake to sweep a patch of mulch aside, plant and then smooth mulch around the plant. Set individual plants no deeper than they were in the flat or pot. When you’re finished planting, presto, so is the mulching.